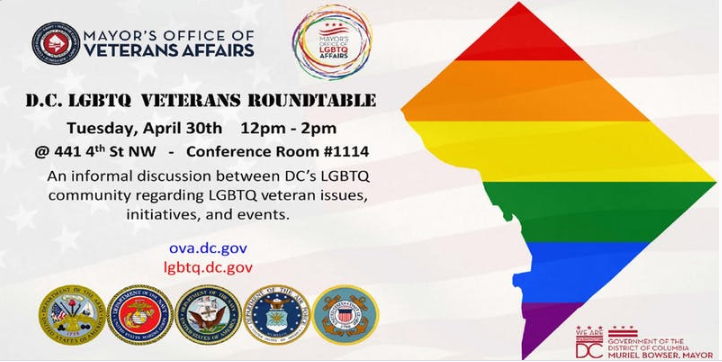 The DC Mayor’s Office of Veterans Affairs (MOVA), in partnership with the Mayor’s Office of LGBTQ Affairs proudly host The Veterans LGBTQ Roundtable. A roundtable event for military veterans who identify as LGBTQ, LGBTQ and other community activists, medical providers, veterans advocates, and allies of the LGBTQ community. The goal of the event is to identify and discuss obstacles faced by members of the LGBTQ veterans community in seeking benefits and services, as well as to hear stories and examples of how such obstacles have been and can be overcome. For accessibility accommodation requests or if you have general questions, please reach out to Sharod.Wade@dc.gov or call (202) 724-5454.